This is the first time and possibly the last that I use banana’s for a recipe. See, I am allergic to them and I hate cooking things I can’t taste, but hubby had two ripe ones sitting around and I was desperate. Don’t worry though, this recipe got the seal of approval from banana lovers, so I am comfortable in sharing the recipe. I created this after a cake that I have made at least ten times failed miserably, beyond repair. *This is one of the easiest cakes I have made. 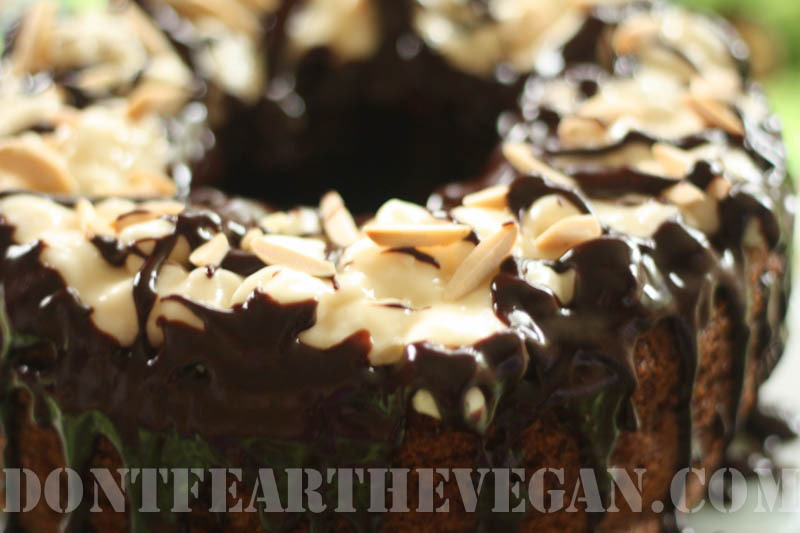 If you are new to vegan baking this is a great starter cake. *This is a very basic cake recipe and the type of ‘milk’ you use is very important because it will add a lot of flavor. I think a variety of chocolate milk would work well. I recommend not using plain. *When baking the cake will rise up on the sides and the center will cave slightly in. Do not worry! *Almonds are not crucial for this cake. I just had a wild hair and added them at the last-minute. * I was told it would go very well with some vanilla ice cream over it. Preheat oven to 350 degrees. Lightly grease a 9″ bundt cake pan. In a large bowl mix flour, salt baking soda, baking powder, and egg replacer. In a separate bowl mix sugar, oil, banana, milk, maple syrup and cinnamon. Slowly mix sugar mixture into flour mixture and stir until well blended. Pour batter evenly into the pan. Tap bottom of pan to get air bubbles to the top. Bake for 40-45 minutes. Cake will pull away from side when done (stick a knife or skewer in it to make sure it comes out clean.) When done let sit for approximately 10 minutes or until cool enough to touch pans with bare hands. Flip onto cooling rack. Let cool completely before icing. Melt marshmallows and white chocolate with almond milk. I used a glass temperature safe bowl over a pot of boiling water. A double broiler will also work if you have one. You do not want marshmallows to melt completely. I wanted them to have the lumpy, cloud look. Once chocolate chips are melted you can probably call it good. Melt chocolate with almond milk. I used a glass temperature safe bowl over a pot of boiling water. A double broiler will also work if you have one. Spread almonds on a cookie sheet and bake for approximately 10 minutes until golden brown. Place banana cake on serving plate. Spread marshmallow fluff over top of cake while still hot. With a spoon drizzle hot chocolate over the top of fluff, on the side and inside the hole. I tried to get chocolate on as much of the outside as possible. I poured remaining chocolate on the inside of the hole so that there would be extra chocolate with each serving. Add almonds on top. Wowwww! That looks so gorgeous. Very exotic!!! Superb.